Past couple weeks Abi has been trying to pull herself up from sitting to standing, but it seemd almost impossible yet. I put her for her morning nap today and about an hour later I saw on the video monitor she woke up. A moment later all I saw were her legs. 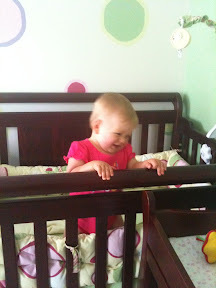 I went upstairs to her bedroom just to see her..... standing up and smiling all proud of herself. I let her play in her bed for a moment to write on Facebook about it and then she did it couple more times when I was there watching her. Each time easier and faster with less and less effort.